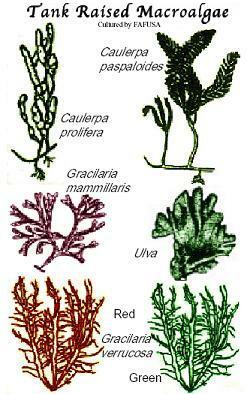 In addition to microalgae, Florida Aqua Farms Inc. cultures several species of saltwater macroalgae including several species of Caulerpa, Gracilaria and Ulva that are cultured in our 15,000 gallon closed recirculating system. Some species are obtained from aquatic farmers or collected from natural populations. As opposed to all other suppliers of macroalgae, we sell only algae that have been acclimated and enhanced for a minimum of two weeks or longer in our closed facilities. Good for ammonia and nitrate removal in closed systems. Some are good live food items for invertebrates and fish. We sell only plants which are known to survive in the average marine aquarium.